Movie Review: Anja Marquardt’s directorial debut is a slippery, low-budget indie drama, set in New York, which is unable to suppress a painful superficiality of a plot about a sexual surrogate who, in a prohibitive way, falls for a client. About to finish her masters in behavioral psychology, Ronah (Brooke Bloom) is a gentle, self-assured woman who helps men with high levels of anxiety and problems in achieving intimacy in a relationship. When Johnny (Marc Menchaca), a reticent nurse who takes care of his handicapped sister after work, signs the agreement and pays, Ronah was far from imagining she would fall for him after breaking the initial emotional impasse. This situation, besides compromising the trust that was patiently built in their professional relationship, triggers other dangers for her to be closely exposed. Apart from this central topic, Ronah has other concerns such as freezing her eggs for the future, dealing with construction issues at her apartment and the imminence of a lawsuit, and giving all the support she can to her brother while he takes care of their sick mother. The film is sluggish and yet mysterious in a first phase, but after a while it sticks solely with the sluggish. The highly structured images oppose to a series of happenings that are presented in a disorganized and underdeveloped way. 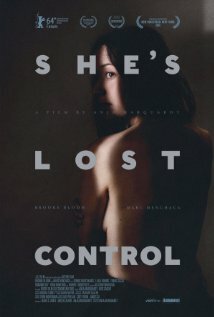 Choppily edited by Marquardt and Nick Carew, “She’s Lost Control” seems more a set of collages that slowly lead us to an upsetting ending. Mrs. Marquardt has several narrative constraints to analyze in her premier, regardless the controlled technical routines of her filmmaking style and a droll cinematography by Zack Galler. Even Brooke Bloom seems not to fit quite well, and the depth of the accounts portrayed here was never satisfying.